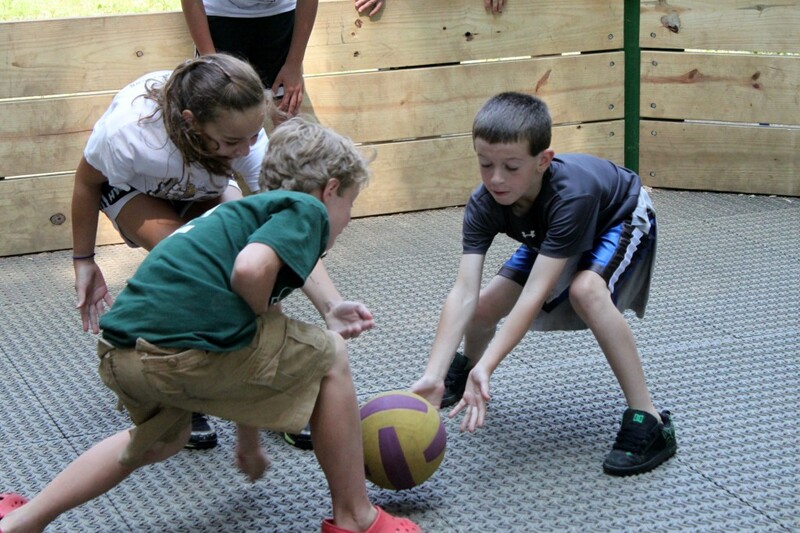 A highlight of summer 2011 for many campers and staff was the addition of the GaGa Pit. An octagonal wall allows many participants to enjoy an exciting, fast paced game of GaGa, a form of dodgeball. The game starts by throwing the ball up and shouting Ga the first two times the ball hits the ground and continues until only one person is left in the pit. After that everyone jumps back in and a new game begins. It doesn’t matter if someone has quick feet or slow, is young or old, jumps high or not, anyone can play and have a lot of fun! Many campers would have loved to play this game all day every day. Some campers cleaned up meals faster to play GaGa. The pit was always full during free time. If you haven’t played the game yet, get yourself up to the hill to play. Tuna and Cheeks are always ready for a game of GaGa! Special thanks to YoYo, Chad Yoder, Brian Goshow and Gerry Hawkes for playing significant roles in the construction of the GaGa Pit! Thanks also for the Eco Track Gerry, and the brackets Brian! A video of Gaga at night in the snow! Sojourner 2011, How have you changed? It was an uncertain step that brought me to BBC and now that step has been leaving this home and family. I can’t say I’m AT camp anymore, but I can say I’m going to continue to experience different elements of it when I go back to school. That means sharing experiences and life (cooking together and sharing meals); doing activities that allow you to be child-like; sharing needs and offering our resources to meet those needs; sharing roses and thorns so that we can rejoice and mourn with each other; surrounding each other with love (not judging) to allow everyone to be valued as God’s creation; being vulnerable and honest; challenging each other in our beliefs; intentionally encouraging; letting go of what others think and living behind the curtain, in the most holy of places, by seeking his kingdom first in everything (and the list goes on). Camp is being in this state of abandon to God which results in unexpected transformation. May we continue to live camp and live changed. Sojourner 2011, What does it mean to have a relationship with Jesus? The skit that I show in this clip is called the Everything skit because of the song (which I have playing as my background music) that it is performed to. Several of the campers, the counselor Socks and Creek (as Jesus), put this on for coffee house. I knew immediately that I wanted to include it in my video. For one, this last week we talked a lot about distractions. The very first fireside Creek had us write our distractions, things that might keep us from focusing on God that week, on a ball. Then we all went out into the dark field and each cabin punted their ball away. It seemed a way of saying that for us to have close fellowship with Jesus, an intimate relationship, it was necessary for us to cast away everything in this world that was hindering us. Yet as this skit shows, it is impossible to do this in our own strength. Hearing the camper’s answers for this question, I was impressed by their maturity and sincerity. They really got it. I’d like to say this was true of every camper. However, then there would be no reason for this camp’s ministry. What’s more is that no matter how much you think you understand what it means to have this relationship, no matter how long you’ve been following Him, there are always more ways to “come up higher”. In other words, to move away from this world and closer to the creation God meant you to be. In the beginning of the week I joined one cabin for their shelter chat. It was right after Jumpstart when Creek had talked about having a relationship with Jesus and asked us to discuss what we thought that meant in our cabin groups. For the first part of the shelter chat I just listened. I wanted to hear what the girls thought. Although not all of them spoke the ones that did expressed that Jesus was someone you could go to in hard times, but that it was hard to maintain a relationship because life got in the way. Basically what I heard them saying was that there wasn’t time to seek Him unless all else failed, then he was there as like a backup. So in a way they could count on Him, but he was like a forgotten crutch that they only pulled out when human hands disappeared. I was saddened to hear this, I was almost screaming inside wishing I could make them see that God wanted to share their joys as well as their pain. I shared with them how I was learning to have constant communication with Jesus talking to him every moment of the day, the good and the bad, just like a earthly father or friend. Although I will never know if what I shared had any impact on those girls, I do know that many campers came away from this week walking more closely with Jesus then ever before. They grasped this idea of a mutual relationship, loving Jesus back and sharing life with Him – the thorns as well as the roses. Sojourner 2011, Why do we sing? & What does worship mean to you? This verse tells us to come before Him with singing as an attitude of thanksgiving to enter his holy presence. Several times this summer I have gone to jumpstart and felt tired or upset about something. Yet when I begin to sing and think about the words, I realize God’s goodness and promises are unchanging and there is always a reason to rejoice in who he is and thank Him for how he’s at work around me. As verse 3 points to, singing seems to be a way of acknowledging God’s eminence as our king and magnitude as our creator. It’s also a way of humbling ourselves and lifting Him on high. Worship goes hand in hand, but singing becomes worship when it is used as a means to minister to God’s heart , when it is solely for Him and about Him. The lyrics become prayerful and a way of talking to God. The unique aspect about singing and worshiping together at camp is that we come together as one to make a joyful noise to the one we all love and are all experiencing through the same activities throughout the week. I never witnessed such honest worship than here at camp this week. Each time the teens would, of their own initiative, join hands or link arms during the songs. I’m pretty sure they didn’t care who they were next to or what they looked like or what anyone else thought. Several time during the week Creek, our camp shepherd, would have us pause for a moment and look around to take in the way we were coming together in worship. This is what happens when it becomes about God rather than us. This kind of worship extends beyond singing at one time during jumpstart or fireside. As one camper wisely pointed out, true worship is striving to live your life in a way that is pleasing to the Lord, conforming to his image in every moment. So, to state the sad truth, the summer is over. I never really allowed myself to believe this community of love would come to an end. Yet I’m also beginning to see how it can be possible outside of camp and without the incredible body of staff that I got to know this summer. For this one I would just like to point out the theme that emerged of friendship. I’m always surprised at the different message that forms from this same question each time. To me, this “why camp?” shows that it’s worth risking getting to know someone, is worth risking love even if it’s just for one week out of every year. 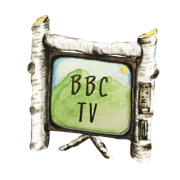 It also shows how BBC has become an integral part of their lives; they can’t imagine a summer without it. “It’s the best place ever” and it’s because of “the people here” that risk relationships with each other and Jesus. Voyager 2011, Who is Jesus to You? Come to the waters, you who thirst and you’ll thirst no more. Come to the Father, you who work and you’ll work no more. His hands, from His brows. Love is near, it satisfies. Streams of mercy flowing from His side. It wasn’t until I had nearly completed this clip that I came across the interview with the two girls at the end where she says, “[he is the one] who died on the cross for us.” I realized no one else had clearly stated perhaps the most obvious and most significant aspect of who Jesus is- he is the one who sacrificed everything for us, to the point of death, so that we could know His love here and now. This week I led a photography interest group for the second time this summer. The first time was so rewarding and so I was pumped to be able to do it again. I planned to be more prepared than the first time by checking all the cameras for battery life and memory card space beforehand. Yet when I went to start the group, two of the cameras wouldn’t work and I had more campers than I did cameras. It took several trips up to the staff cabin frantically looking for alternative cameras to use. It worked out alright, but we started a little late and I was disappointed that we lost what little time we had to shoot. Although I pointed out a few things they could try like macro shots, and explained composition and the rule of thirds, for the most part I stood back and let them experiment. I regretted not being more involved and supportive of the shots they were getting because I was distracted by protecting expensive last-minute borrowed cameras and making sure everyone got a chance to use one. However, when I uploaded the photos to my computer and started looking through them I couldn’t help but be filled with the same joy I experienced last time. There were details of bark, unique perspectives, portraits of campers and staff, surprising captures of action from different interests groups and so on. While I was concerned about keeping everything together, they were simply being enamored by God’s creation and this opportunity to capture it. The next day one of the girls came over to me and expressed her dream of being a photographer one day. She asked about this possibility and I explained the challenges, but encouraged her to go after it with all her heart if that was really what she wanted to do. I loved hearing her enthusiasm about this passion of hers and her hopes to develop that into a career. I was also honored that she looked to me for guidance in this. The boy in the group also had a lot of enthusiasm and shared how he had a relative who is a professional photographer. It was clear that during the group he felt he had a chance to be like this relative he looks up to. Throughout this week I was made aware camper’s aspirations. One day during free time a girl started to share with me how she is writing a novel. I was blown away by the detailed plot she described to me. Others shared dreams of becoming a teacher and so on. I was struck by how God gives his children a vision to use the gifts He’s given them. I pray that these campers never lose sight of these things or doubt what is possible when they dream His’s dreams and let Him be their inspiration. This week I decided to investigate the topic of camp songs one step further with this older age group. I got so many votes for the song Waterfall that I had to divide this clip up into two segments, slow and upbeat. Here is a clip about Waterfall and Light the Fire (also two of MY favorites here). Many campers just said the name of the song and when I asked them why, they said “I don’t know” or “just because.” I challenged them whether or not they had really thought about the words… were they at all meaningful to them? Some admitted they had not considered them and I encouraged them to really think about what they were singing. When I sing these songs I close my eyes so I’m not performing for anyone else, picture each word in my head and then sing them as a prayer to God. I was encouraged to hear several of the campers experienced these songs similarly.